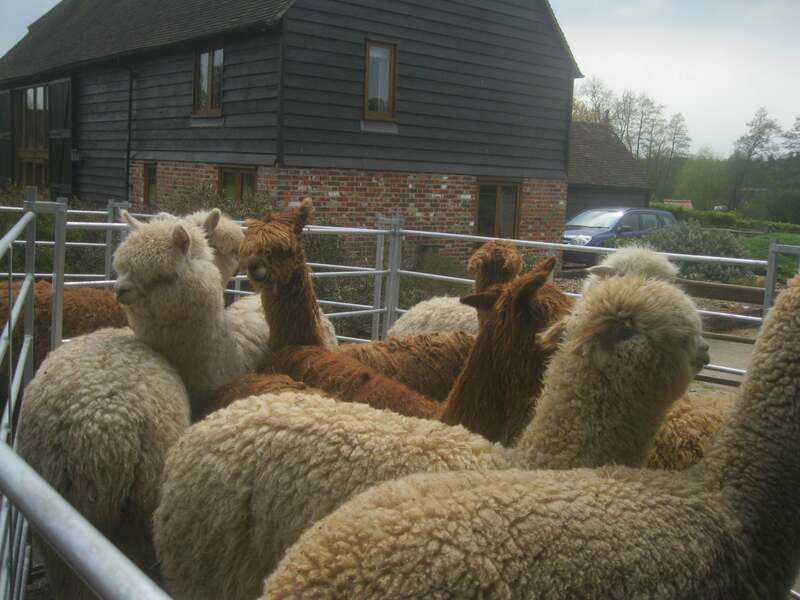 The lads from New Zealand arrived bright and early to shear almost 100 alpacas at Spring Farm Fletching the day after the Spring show at Ardingly. 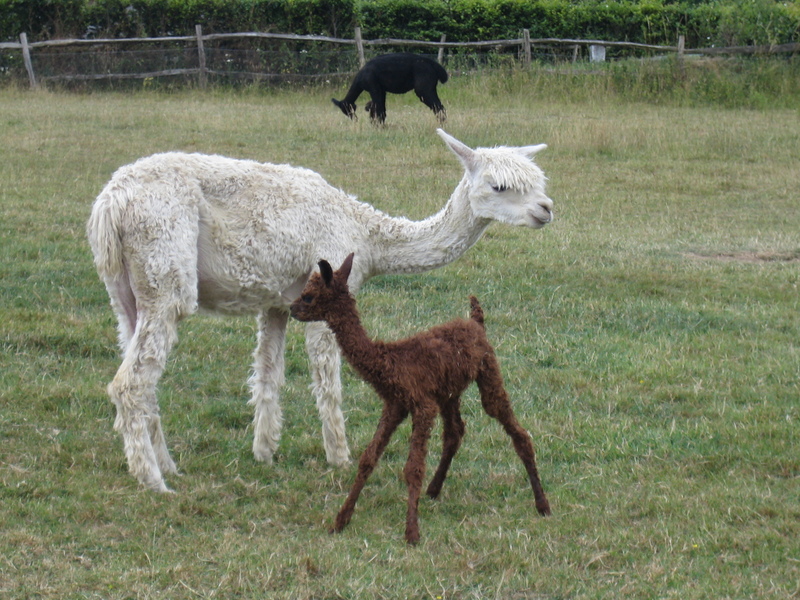 Many of the animals to be shorn were prize winning alpacas and their fleeces were stunning. The shearing ‘crew’ took a wee while to set up, farm helpers and willing volunteers rounded up the alpacas into a waiting area and 2 by 2 they took their their turn to be shorn. The sorting crew had about 6 mins to skirt the fleece,bag and label it before the next one arrived. 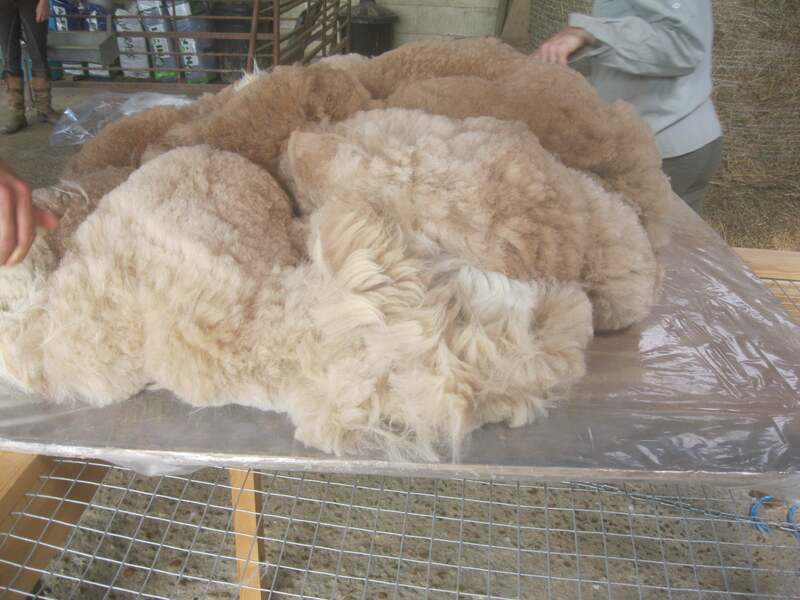 So many beautiful fleeces, I would have liked to take about ten of them home! One outstanding suri really caught my attention and it’s on my wish list. Mostly shades of grey with some brown patches here and there. SImply stunning. If you’ve never spun alpaca before you really don’t know what you’re missing! It requires washing but takes less time than wool. Some people spin it straight from the animal but I feel you trap much dust this way which wont all come out when washed in the skein. I have many colours in stock and can supply washed or unwashed. I had to laugh as one of the alpacas is called Mr Tumble which took me back a few years to when I watched the TV show with my grandson! Learn a new skill and make some fabulous decorations for your home in time for the holidays. 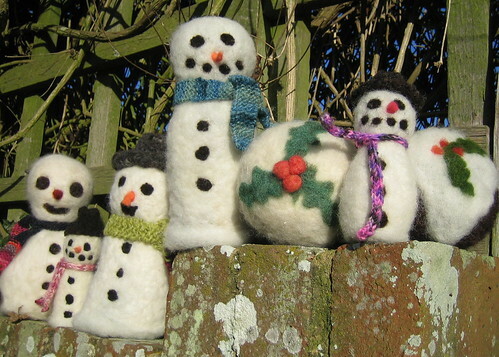 The workshop is being held at Spring Farm, North Hall Lane, Fletching, East Sussex, TN22 3SA. From 10.30am til 3.30pm, homemade soup, tea/coffee and biscuits all included in the £50.00 cost. 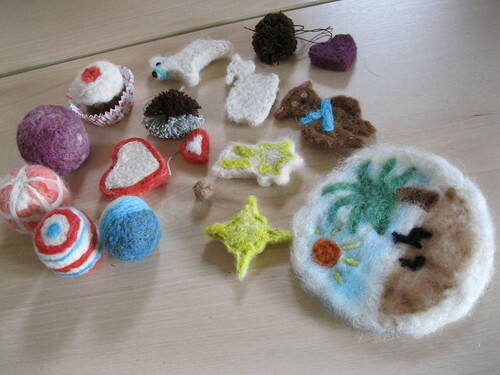 We will use a combination of wool and alpaca in wet felting and needle felting techniques. Christmas angels, baubles, puddings, stars and snowmen. 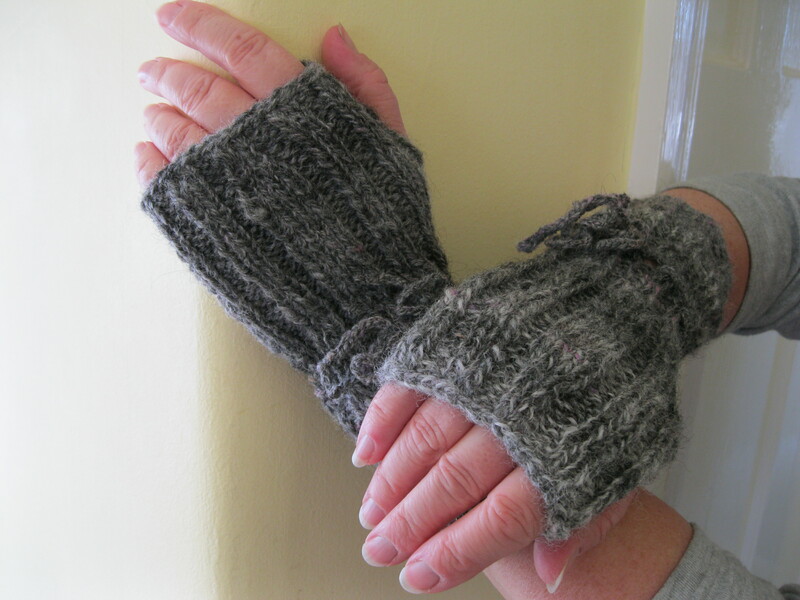 Contact me at knitwitoriginals@gmail.com to find out more or book your place. Book a place for a loved one or treat yourself. There’s nothing quite like homemade! Take a leaf out of Kirsties book and make it yourself! It really is fun! 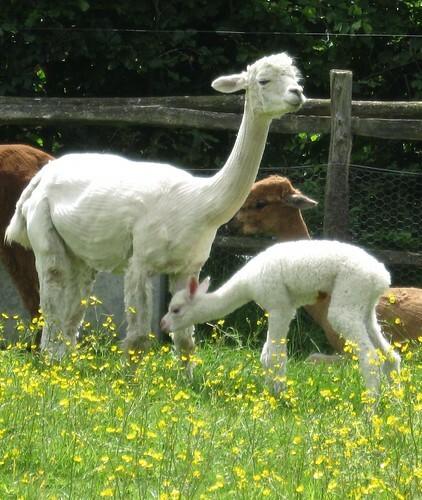 It’s cria time at Spring Farm! Book 2 places together and receive 10% discount! A successful day at the show, spun lots of alpaca and chatted to lots of nice people. The wind howled around the marquee and hat wearing was out of the question. More of the same today I fear. 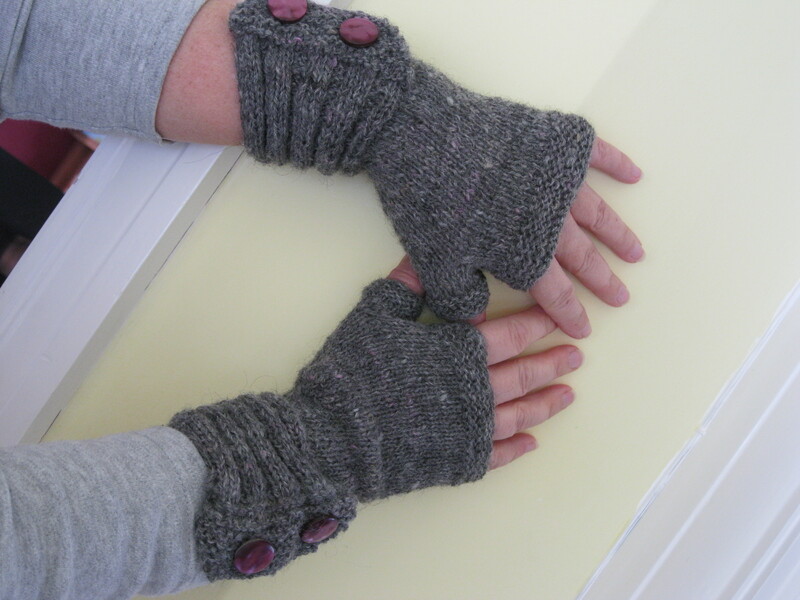 In preparation for the Camelid show at Ardingly in May I have been busy spinning alpaca and knitting mittens using my own patterns. 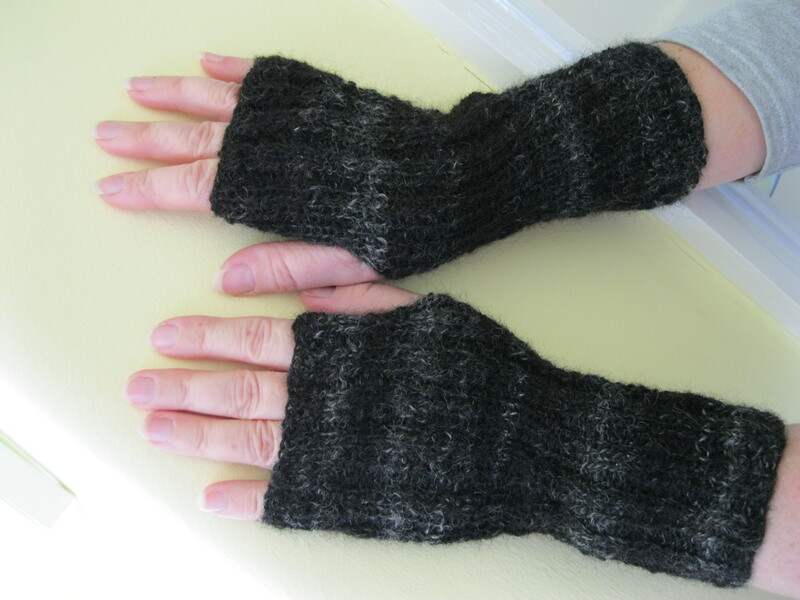 I am very pleased with the results, the mittens are very cosy! Had to head over to see Vicky yesterday and there was a brand new wobbly cria in the field. He was so sweet trying out his legs for the first time and mum followed him around making sure he was ok. The older crias are kept seperately with their mums & we moved them into another field, all the crias charged off on their own leaping into the air and chasing each other, ran into the other field and then came back again before we could move all the mums. This happened a few times before we could get the mums to follow, it was a stampede! Was back at the farm on Friday to help with the bagging of fleece from the remainder of the alpacas. This time the shearer was Australian with a female assistant, the poor girl was in the firing line of all the green spit & by the time we were done I think we’d all had share. Instead of a sandbag on the neck to hold them down the assistant straddled the necks and helped turn the animals for the shearer. Such beautiful fibre & so much came home with me!